Graco is one of the most renowned brands for baby products. They manufacture wide range of products like baby monitors, nursery care products, strollers, travel systems and lots more. 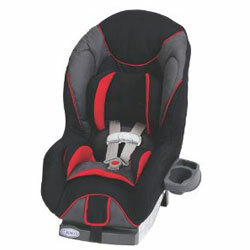 The Graco ComfortSport Convertible Car seat is an affordable forward facing and rear-facing seat. This car seat was created to be straightforward, the belt is easy to access and it is loved by clients due to the user-friendly features. This product was designed for infants from 5 to 30 pounds; this can also be converted later on as a toddler seat for children who are less than 20 to 40 pounds. It comes with EPS Foam liner which makes ComfortSport a light-weight seat and it can easily fit into any car model. It comes with a handy cup holder; this means that toddlers can gain access to their drink without any hassle. It is also latched equipped, with an easy-to-read level indicator for hassle-free installation in the rear-facing position. This product comes in classic Jette red; clients can order a bright and solid shade of red. This is a gender-neutral style. The product comes with an EPS foam liner for impact protection; it is able to absorb crash forces compared with other products that only contain plastic shell. Just like any other product produced in the market, the Graco ComfortSport Convertible Car Seat is bound to have some weaknesses of its own. Some clients have commented that the harness heights are too low for most children and there is a big chance that the child will outgrow the car seat. But the product has its own set of positive aspects, for example this product has a few advantages like the fact that it has a nicer padding compared with other products like Scenera. There are certain adjustments that the manufacturers can improve about the Graco ComfortSport Convertible Car Seat; the manufacturers can make it bigger in order to make sure that toddlers won’t easily outgrow it. The straps could be made higher, but all in all for the price it is not a bad product to have. Manufacturers have made sure that the child who will be using the item is given ample support that they need, the cozy head support was specifically designed to make babies comfortable. Summary : An average product with a very low price.